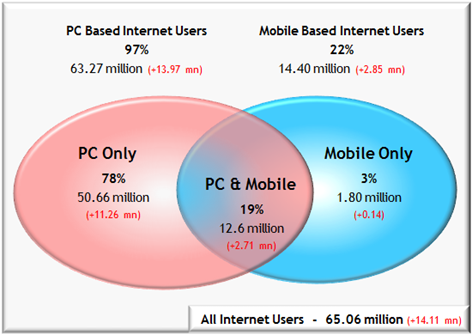 Juxt today released their annual ’India Online 2011’ report which puts number of active Indian Internet users at 65 Million as compared to 51 Million last year. The report released by Juxt is based on land survey conducted among 201,839 individuals spread across all 4 regions of the country between Apr-Mid June 2011! 9 out of 10 of them (86%) use social media sites! ‘Home’ is the single largest place of access (58%), and the most preferred place of access (43%). Email is still the most popular activity on the internet, however, online search of products has picked up significantly making shopping the 2nd most popular activity online. This sure will be music for the hordes of ecommerce sites that have sprung up in recent times. Usage of Social Networking sites has also witnessed significant growth with 86% of all users visiting them! While activities like downloading screensavers / wallpapers, online trading in shares and watching videos showed the most decline in usage. This probably is the biggest positive to happen – increase in online shopping. Like I mentioned before, there has been influx of ecommerce sites over past few months and it is happening for a reason. According to Juxt report – 4 out of 5 internet users ‘shop’ online (search or buy online), translating into a 50 million strong online consumer base. It is also for the first time that online buyers of ‘non-travel’ products (13.5 million) outnumber ‘travel’ ones (8.6 million). Till now online travel used to dominate the online ecommerce in India, which no more is the case! Most of online shoppers purchased mobile phones & accessories (56%), computer hardware and consumer electronics (35% each) and movie tickets (30%). 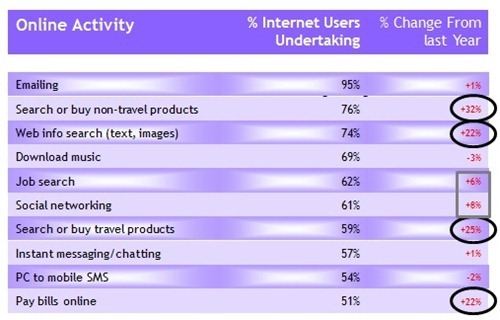 Most bought ‘travel’ products were train tickets (83%) and air tickets (58%). Overall, I think the internet scene is rising in India significantly. I presume that going forward this trend is going to only accelerate given that their are still over 90% Indians who do not have taste of Internet as yet! Imagine, a time when we will have over 500 million internet users! [Updated] Druva bags series-B USD 12 Million Funding from Nexus! This is really good sign for e-business….in India. perhaps its a gud bgn n a sign of modernisation. m least bother of that topic its just 4 fun………….. Awesome report and a very good sign for ecomm in India. by the way, 65 million is more than the population of 200 out of 220 odd countries of the world. 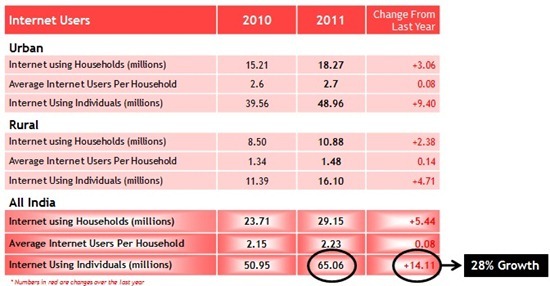 at current rate of growth, 500 million Internet users should be 8 years away? Most of those would use the Internet in a local language, I suppose.